First tried jjimdak in Singapore (Andong Zzimdak has since closed) and found the braised chicken with carrots, onions and potatoes dish familiar albeit spicier. Was a tad disappointed with the one recommended by our hotel concierge though. Another dish reminiscent of homecooked food is japchae – sweet potato noodle similar to tang hoon, stir-fried with sesame oil, soy sauce and vegetables. 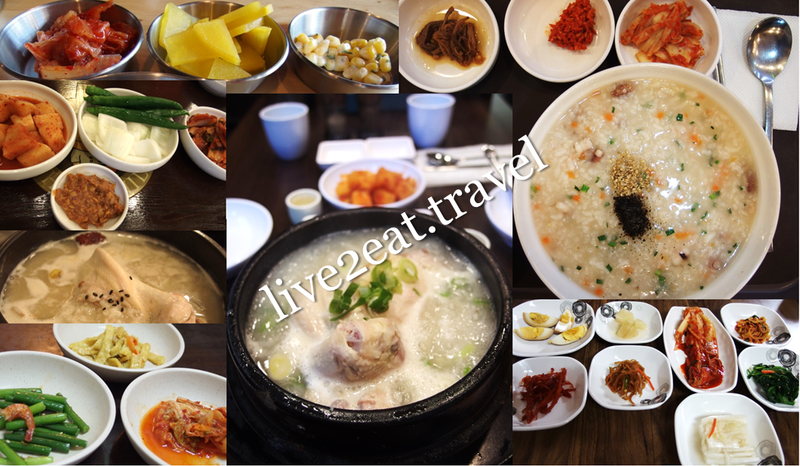 If you cannot take spice, then try its juk or Korean traditional porridge. Tried its abalone juk but could not discern any abalone in the thick consistency porridge. Yet another familiar dish, and one that is not spicy, is jokkbal. Pig trotters braised in soy sauce, garlic, ginger, rice wine and other spices. 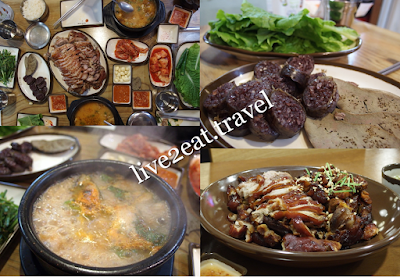 We chanced upon this while looking for dinner and saw many Koreans relishing in the meat. The portion was huge, and came with a stew and blood sausage. Enjoyed this enough to ask our hotel concierge for recommendation during our last trip and this time, it was good. 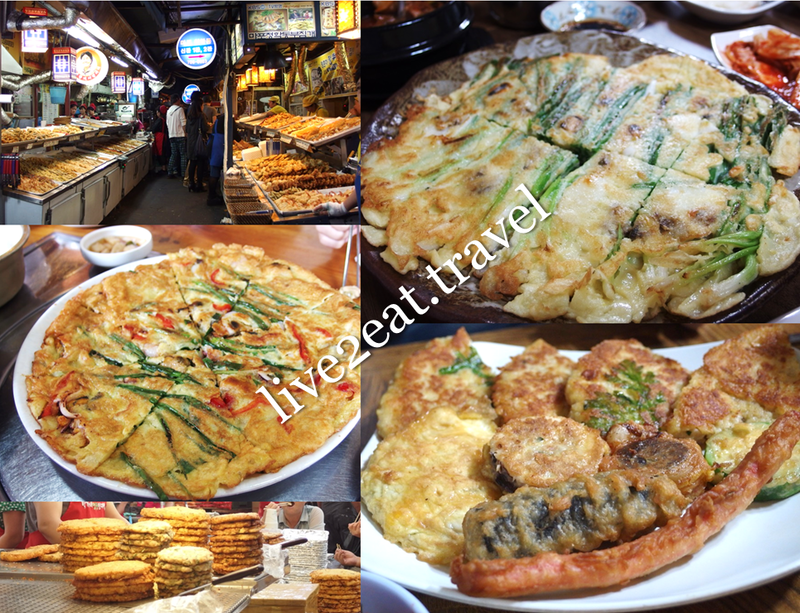 Jeon or pajeon is Korean pancake filled with ingredients like meat, seafood and vegetables, dipped in egg and deep-fried. Korea's patbingsu or bingsu is shaved from frozen milk, which makes it fine and smooth. More similar to Taiwan's shaved ice than our ice-kachang, it is sold at cafés with a variety of flavours and toppings such as red bean paste and soft rice cakes. Found soft serve too milky for my liking but liked Preferé ice-cream so much that I had it three times in my first trip, and looked high and low for it on my last trip. How can you visit Korea without trying its ginseng chicken soup? A whole chicken stuffed with glutinous rice, jujube or dried red dates and garlic, is boiled in a broth with ginseng root, ginger and scallions. Pull the chicken apart with the metal chopsticks and dip the tender meat into the accompanying salt and pepper to accentuate its sweetness. Glad to find a good one – smooth and mildly sweet broth, on my last trip which was recommended by our hotel concierge. Banchan are the usually-complimentary-and-free-flow side dishes served after you place your order in a Korean restaurant and can include kimchi, radishes and more. Do not feel obliged to finish them, so leave the kimchi alone if you are sick of it. 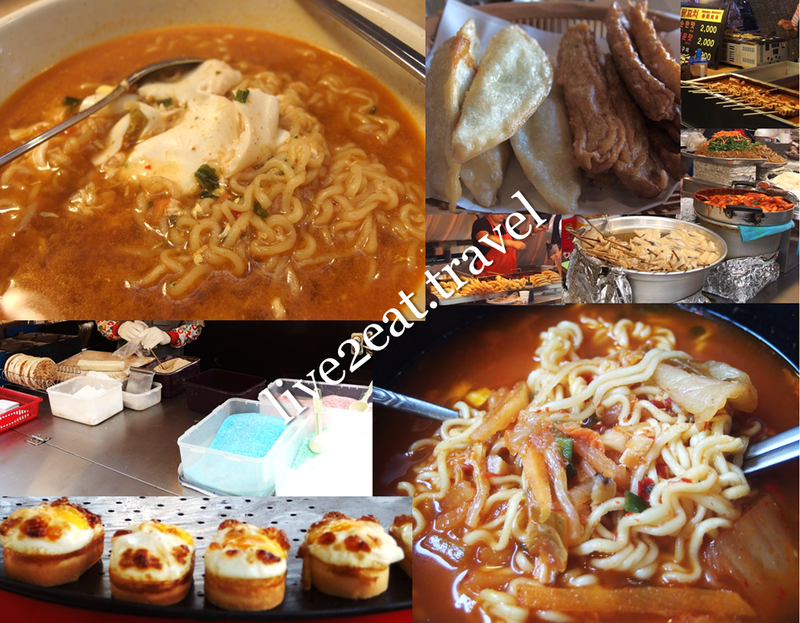 Ramyeon, not Japanese ramen but instant noodles, is comfort food. It can be found at the market and in restaurants, and comes with meat, seafood or dumplings. Similar to Chinese jiaozi or Japanese gyozas, Korean dumpling or mandu contains pork and vegetables. Another street food I like is Gyeranbbang, an egg baked into fluffy bread that was a tad oily. Others include hotteok – pancake stuffed with sweet or savoury fillings such as red bean paste, peanut, sweet potato or japchae, odeng (fish cakes and vegetables on skewers boiled in hot savoury broth) and tteokbokki, chewy rice cakes usually cooked with fish cakes in a thick red sweet chilli sauce or added into one of the above dishes.